A typical plant that has not been well maintained will likely have a leak rate equal to 20 percent of total compressed air production capacity. On the other hand, proactive leak detection and repair can reduce leaks to less than 10 percent of compressor output. In addition to being a source of wasted energy, leaks can also contribute to other operating losses. Leaks cause a drop in system pressure, which can make air tools function less efficiently, adversely affecting production. In addition, by forcing the equipment to run longer, leaks shorten the life of almost all system equipment (including the compressor package itself). Increased running time can also lead to additional maintenance requirements and increased unscheduled downtime. Finally, leaks can lead to adding unnecessary compressor capacity. How do you estimate the Size of Air Leaks? Answer: It’s not very hard. We’ll use the “TIME METHOD” to estimate percentage % of loss due to air leaks in your plant. The result tells you 29% of your air compressor’s CFM’s are maintaining your AIR LEAKS. This would mean that you are losing almost ONE THIRD of your compressed air to air leaks. Learn where most leaks usually occur and how much compressor air leaks can cost you and the best ways to detect and fix leaks. Get your free PDF Air Leaks Answers now. 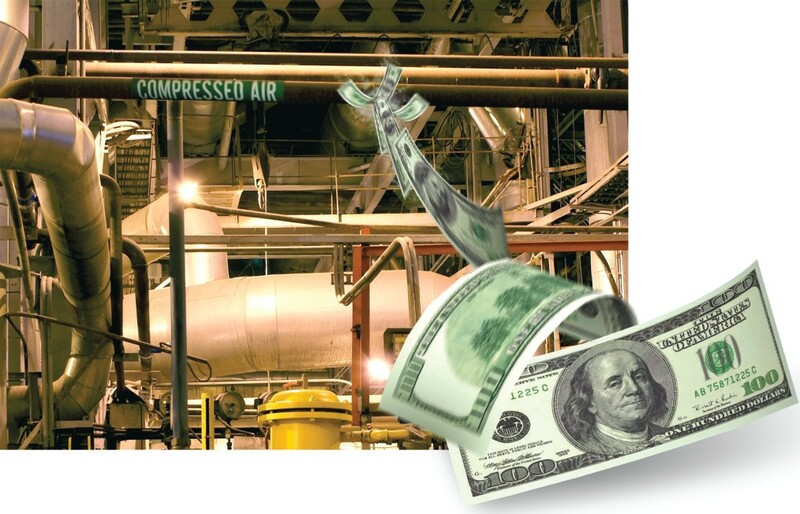 Providing compressor answers that save you time and money.